During my recent cruise on Royal Caribbean’s Allure of the Seas, I had the opportunity to visit the medical center and check out the ship’s trauma care capabilities. 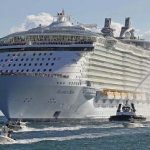 The major cruise lines, including Royal Caribbean, abide by the “Health Care Guidelines for Cruise Ship Medical Facilities” published by the American College of Emergency Physicians (ACEP). This document outlines the staffing, space, equipment and administrative capabilities needed to provide the highest quality of care at sea. The ship is staffed by three emergency physicians and five nurses. Each physician is on call for a 24 hour period and has the following day off. The doctors and nurses provide comprehensive medical coverage to passengers and crew for both emergent and non-emergent problems. All of the physicians are ATLS certified, and some are ATLS instructors. The medical staff responds to medical emergencies around the ship (code alpha) and have regular clinics in the medical facility for patients with less urgent problems. There is a specific treatment room for surgical / trauma problems that is well stocked with equipment for all procedures that might be required. This includes chest tubes, airway equipment, fracture care and more. A separate treatment room for medical patients can also be used as an ICU, with ventilators, invasive monitoring, and vasoactive medication drips. There are a number of other exam and treatment rooms that are used for patients with less urgent problems. Digital xray equipment is available for conventional imaging, and the laboratory can do most routine tests as well as a few more exotic ones. Many of the tests are performed using iStat type equipment. The pharmacy carries a wide variety of medications. Due to space constraints, only one drug of each particular class is carried, which is sufficient for the majority of medical issues. If patients sustain significant injuries that require services not available in the medical facility, they can be airlifted off the ship if it is within 150 miles of a port. If not, the medical treatment room is converted to an ICU and the patient remains there until they can be moved off the ship. I was quite impressed with the facility and how much can be done in the available space. The staff is quite skilled and personable, and very aware of their capabilities. They are also in tune with the capabilities of the hospitals in the various ports of call, and have well thought out procedures regarding who can be taken care of on the ship and who needs to be transferred ashore. Being a paranoid trauma surgeon, I always think about which trauma centers are nearby when I travel. After seeing the medical facility on the Allure, I am quite comfortable that they can handle the vast majority of traumatic injuries that might arise on the ship. It’s dirty work but someone’s got to do it. I just returned from a seven day cruise on Royal Caribbean’s Allure of the Seas. Quite an impressive ship! I visited the medical center to discover how injured patients are managed at sea. I’ll share the details tomorrow!